← What Is It About Dissolution That Everyone Finds So Confusing? This photo captures Chretien’s wiliness and Blair’s mild amusement thereto. If you asked Canadians, Britons, or Australians which minister is the most important after the prime minister, you would almost invariably get the same answer: the Finance Minister — known as the Chancellor of the Exchequer in the United Kingdom and Treasurer in Australia, but they fulfill the same function. In contrast, if you asked Americans which of the President’s cabinet secretaries is most important, most would probably cite the Secretary of Defence, or possibly the Secretary of State. The Secretary of Homeland Security and the Attorney General would round out the top four. But, having lived in the United States for five years (2001-2006), I’m confident that none of them would mention the Secretary of the Treasury! Even those who generally pay attention to the news might not know who occupies that office at any given moment. I knew that Rumsfeld and Powell were the Secretaries of Defense and State in 2004, but I couldn’t have told you at the time who was the Secretary of the Treasury. There is a very good reason for this, which I shall return to in the conclusion. But first, I shall discuss a very amusing example that illustrates the point. I generally enjoy reading the autobiographies of former heads of state and government; while they are, by definition, exercises in propaganda, they also offer interesting insights into how the executive branch of government works in practice and how successful politicians think and deal with both routine matters and crises. (I emphasize “successful” politicians, because the unsuccessful and mediocre, like Joe Clark or Kim Campbell, tend not to write memoirs in the first place. What would they even write? And who would bother to read them?) Thus far, I have Margaret Thatcher’s, Tony Blair’s, and Jean Chretien’s memoirs. Tony Blair’s memoir, A Journey: My Political Life, contains a passage that Canadian politicos would very both interesting and amusing. He describes a meeting that he took with Gordon Brown on 15 March 2006, the day that the Cash-for-Access Scandal broke. The controversy involved a Labour Party fundraiser who had allegedly offered peerages in exchange for donations, under the guise of loans, to the Labour Party, given that new accountability laws only required that the names of donors be published, but allowed those who gave loans to remain anonymous. In any event, the Blair government had set up an Appointments Commission for life peerages in the House of Lords, which reduced the prime minister’s absolute authority to nominate new peers and made these patronage appointments more difficult. (Incidentally, Prime Minister Trudeau drew upon the House of Lords Appointment Commission, sponsored by the Cabinet Office, in devising a similar Independent Advisory Board for Senate Appointments). This Cash-for-Access Scandal itself didn’t reach the levels of the Sponsorship Scandal, though the British Parliamentary Expenses Scandal of 2009-2010 bears a resemblance to the Senate Expenses Scandal. Anyway, it [the meeting] was not pleasant and there were things said that should remain in the privacy of that room and our recollection. Suffice to say, he [Gordon Brown] felt I was ruining his inheritance and I felt he was ruining my legacy. The similarities between the strained dynamic between Tony Blair and Gordon Brown on the one hand and the overt bitter acrimony Jean Chretien and Paul Martin on the other are obvious and instructive – and the fact that both Blair and Brown were aware that their conflict mirrored that between Chretien and Martin makes the similarities more amusing. Australian Prime Minister John Howard and the Australian Treasurer Peter Costello also famously feuded with one another throughout the 1990s, and they each represented different wings of the Liberal Party of Australia. Tony Blair’s chief of staff, Jonathan Powell, noted the similarities between these three cases in his memoir, The New Machiavelli, and he superimposes the Canadian example on his British experience and expresses sympathy with Chretien over Martin. Elsewhere in his autobiography, Blair speaks highly of Chretien and trusted his political instincts and followed his advice in May 2001 during the outbreak of Mad Cow Disease. 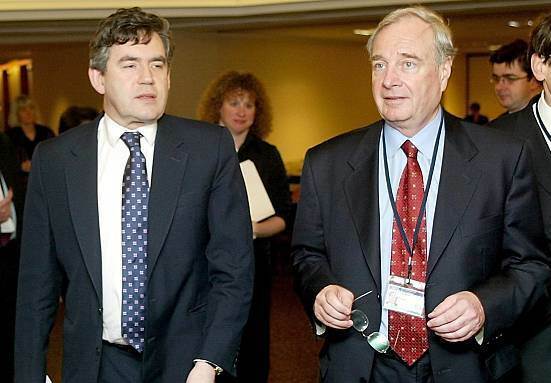 It isn’t much of a stretch to imagine that Blair sought Chretien’s advice on dealing with his troublesome Chancellor, Gordon Brown, based on his experience in dealing with Paul Martin. Brown and Martin had another thing in common: they were also both unkempt and often wore frumpy suits. […] we were well on our way to becoming fast friends. He was open. He was smart. And, to my surprise, he shared more of my fiscal philosophy than I expected from a Labour politician. As our friendship grew over the many encounters we had at finance ministers’ meetings in the coming years, it was not lost on either of us that our relationships to our respective prime ministers was very similar – although that was something that we rarely discussed. Martin deigns to acknowledge that he and Brown only “rarely discussed” their mutual predicament; he doesn’t even try to suggest that they never discussed it. I suspect that they discussed it more than Martin lets on! Martin also describes how he and Brown developed the G20 in 1998-1999, and how they shared in a Social Gospel and advanced the policy of forgiving the debt and loans from developing countries after drawing inspiration from the Jubilee Debt described in Leviticus 25:25-55. Their friendship endured even after Martin’s premiership. Blair and Brown shared a genuine friendship in the 1980s, but they friendship turned into rivalry in 1994 after making their infamous “Deal”, where Brown agreed to spare the Labour Party a fractious leadership election in exchange for supporting Blair and being poised to become the most autonomous Chancellor of the Exchequer that the United Kingdom had ever seen. In contrast, Chretien and Martin fought a bitter campaign for the Liberal leadership in 1990 and had always loathed and mistrusted one another — and neither had ever seriously tried to pretend otherwise. Blair led his “New Labour” to three parliamentary majorities, served as prime minister for 10 years, and became the most successful Labour prime minister in history. Chretien led the Liberals to three consecutive parliamentary majorities (the best since Sir Wilfrid Laurier’s four consecutive majorities) and served as prime minister for 10 years. Along with Bill Clinton, they both considered themselves “Third Way” center-left politicians whose governments balanced social justice and economic liberalism. And, of course, both Chretien and Blair had fraught relationships with their finance ministers. Paul Martin succeeded Chretien under the cloud of the Sponsorship Scandal, and it is clear that Chretien made the decision to prorogue Parliament in November 2003 in order to prevent Auditor General Sheila Fraser from tabling her report on the subject until after Paul Martin had become prime minister and reconvened the next session of parliament. He served as prime minister for only just over two years. Similarly, Gordon Brown succeeded Tony Blair but only served as prime minister for 3 years. Both earned rebukes as indecisive and weak leaders who paled to their predecessors, and both led their parties to humiliating electoral defeats and years in opposition. The Economist famously dubbed Paul Martin as “Mr. Dithers,” and the British press also attacked “Bottler Brown” for his disquieting indecisiveness over whether to call an early general election 2007 (since prime ministers could still do snap elections prior to 2011), and whether to participate in a Canadian-style televised leaders’ debate when the election finally arrived by necessity in 2010. Some Canadian media noted this same passage in Blair’s memoir when it was published in 2010, but they certainly did not delve more deeply into the matter. And the Globe and Mail’s headline that “Blair’s memoir reveals how Chretien-Martin fuelled his split with Brown” is a gross misrepresentation of both Blair’s autobiography and Canada’s importance. 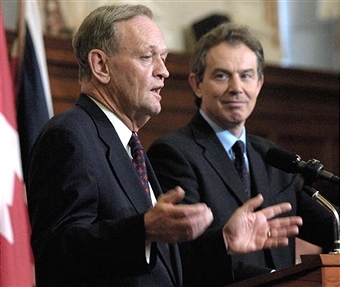 Chretien eventually fired Martin and dismissed him from Cabinet in 2002, but Blair never dismissed Brown, though, according Jonathan Powell, he did consider doing so on several occasions. The Toronto Star’s headline “Tony Blair’s memoirs cite Chretien-Martin Fight” is accurate because it simply states a fact and doesn’t exaggerate Canada’s importance. As amusing as they are, these similarities between political rivalries in the United Kingdom, Canada, and Australia reveal a fundamental characteristic of parliamentary systems of responsible government. The Constitution Act, 1867 entrenches Responsible Government and this balance between the executive and legislature through sections 53 and 54. Section 53 mandates that all money bills must originate in the House of Commons, from which the bulk of the Ministry is drawn; section 54 states that all money bills must receive the Royal Recommendation, which the Governor General grants on ministerial advice. In other words, only the people’s elected representatives can introduce bills that would levy tax or grant expenditures, and that bill can only proceed if the executive wishes to take responsibility for it. Lord Durham referred to this arrangement as “the real protection of the people.” Responsible Government does not “fuse” the legislature and executive, as many lazy and incurious late 20th- and early 21st-century political scientists say. Instead, Responsible Government maintains a narrow separation of powers and brings the executive and legislature into balance and “harmony,” as 19th-century scholars like Alpheus Todd said, and makes them act on the same wavelength. . In contrast, the United States Constitution sets up a presidential-congressional system that relies on a rigid separation of powers and a republican equivalent of the 18-century British system. The Ineligibility Clause prevents the executive and legislature from operating on the same harmonic wavelength and expressly forbids the congressional representatives from serving simultaneously as cabinet secretaries. This is why Responsible Government could never have developed by convention in the United States. While the Origination Clause of United States Constitution also drew upon the British tradition and mandated that money bills must be introduced in the lower house, the House of Representations, the US Constitution contains no equivalent to the Royal Recommendation. The President introduces a budget to Congress, but Congress can amend or reject it and retains the absolute and ultimate power of the purse. Neither the President nor the Secretary of the Treasury are responsible for the budget that Congress passes. The President and cabinet secretaries remain in office pursuant to Article II of the US Constitution, not at all based on whether they command the confidence of Congress. That is why no American would suggest that the Secretary of the Treasury is the most important cabinet secretary. The Minister of Finance in Canada, the Chancellor of the Exchequer in the United Kingdom, and the Treasurer in Australia are the most important cabinet ministers after their respective prime ministers because Responsible Government is all about the money: who proposes taxation and spending (the executive), who approves taxation and spending (the legislature), and who takes responsibility for taxation and spending (the executive). In contrast, the Secretary of the Treasury of the United States doesn’t matter because he cannot and does not take responsibility for taxation, spending, and the budget. The Finance Minister is the most important after the Prime Minister because he is responsible for fiscal policy and the budget. Tony Blair, A Journey: My Political Life (Toronto: Alfred A. Knopf Canada,2010), 598-599. Peter Hartcher, “Fiscal Feud: The Conflict Between John Howard and Peter Costello Ran Much Deeper Than Mere Political Tensions,” Sydney Morning Herald, 25 April 2009; Peter Hartcher, “Howard Unleashes: Elitist Costello Blew His Chance At Power,” Sydney Morning Herald, 22 October 2010; Paul Kelly, “Peter Costello Blew His Chance by Pushing Me, Declares John Howard,” 22 October 2010. Jonathan Powell, The New Machiavelli: How to Wield Power in the Modern World (London: Vintage Books, 2010), 106. Paul Martin, Hell or High Water: My Life In and Out of Politics (Toronto: McClelland and Stewart Ltd, 2008), 197. Martin 2008, 249-250; Jean Chretien, My Years as Prime Minister (Toronto: Alfred A. Knopf Canada, 2007), 400. CBC News, “British Magazine Dubs Martin ‘Mr. Dithers,'” 17 February 2005; BBC News, “How Election Fever Developed,” 7 October 2007; The Guardian, “Gordon Brown Accused of ‘Dithering’ Over TV Debate,” 29 September 2009. Doug Saunders, “Blair’s memoir reveals how Chrétien-Martin fuelled his split with Brown,” Globe and Mail, 1 September 2010; Bruce Campion-Smith, “Tony Blair’s Memoirs Cite Chretien-Martin Fight,” Toronto Star, 1 September 2010. Janet Ajzenstat, The Once and Future Canadian Democracy: An Essay in Political Thought (McGill-Queen’s University Press, 2003), 64, 66-67. Alpheus Todd, Parliamentary Government in the British Colonies, 2nd Edition (London: Longmans, Green, and Co., 1894), 26. This entry was posted in Parliamentarism v Presidentialism, Responsible Government, Separation of Powers. Bookmark the permalink. acknowledged, thanks. I’ll change the terminology accordingly. Sometimes I get mixed up with all these countries’ official usages.